It’s hard to believe that 72-years have passed since the Attack on Pearl Harbor by the Imperial Japanese Navy. On the tenth anniversary of this infamous event, I had just turned eight years of age when my Dad, A.C. Weatherly Jr. first shared his memories of the event with me. I’ll share them after a brief introduction. A warm Sunday morning; about 7:45 a.m. to 8 a.m. Church bells, laughter a day of peace and rest. 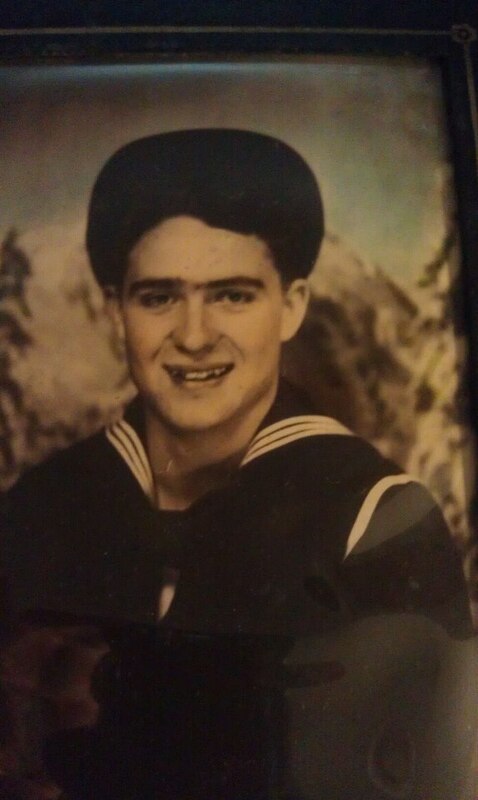 My dad, A.C. Weatherly Jr. is shaving and about to step ashore but on this day that would not happen. Klaxons Sounded, Squawk Box Screamed, Air Raid Pearl Harbor, December 7, 1941. A crash of steel upon steel from an enemy torpedo struck amidships on the port side. A deafening roar and concussion shook Raliegh as the torpedo detonated. The hull rose, fell and began a to port. USS Raleigh (CL-7) became one of the first casualties at Pearl Harbor that Day. About an hour after the torpedo hit, an armor piercing bomb crashed through bulkheads and explodes a short distance beyond her hull, barely missing an aviation fuel take; a fuel tank used to service the catapult patrol plane on the fantail. Amazingly, no one died aboard Raliegh that day… a tribute to the heart, training and dedication of all who fought bravely to keep her afloat. Dad shared the following anecdote. 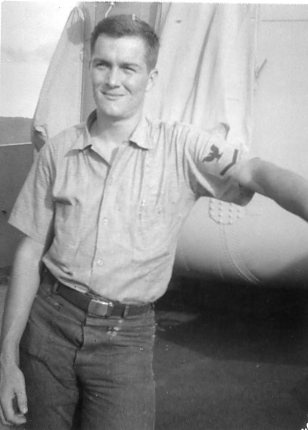 He told of being a member of a bucket brigade passing water to a machine gun on the mast because the torpedo disabled the water pumps that supplied water to the water-cooled guns. She was kept afloat by jettisoning everything not permanently attached; barges supported, pumps counter-flooded and breaches in bulkheads were shored. Raleigh made it, survived and continued to serve for the duration of the war. Recently my Aunt Sallie Weather Hebisen shared a background story about events during that weekend. At the same time as her oldest brother’s status remained unknown because of the attack, their dad Andrew Claude Weatherly Sr. had been hospitalized after a bad car accident. They learned eventually that my dad was safe and my grand-dad had a severe back injury. Vigilance must never fail. Thanks to that Greatest Generation, so few now but always honored and yet we pay tribute and go on to fight our wars and win the peace for future generations. I’ve invited Patty Wiseman to continue this tribute. 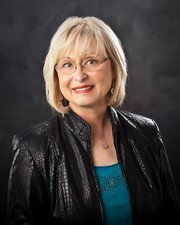 Award winning author Patty Wiseman is a friend and we share this event in common through our fathers. Both were aboard USS Raleigh (CL-7) at the time of the attack. The article that follows is her story about the Raleigh during the attack as she learned it from her father. 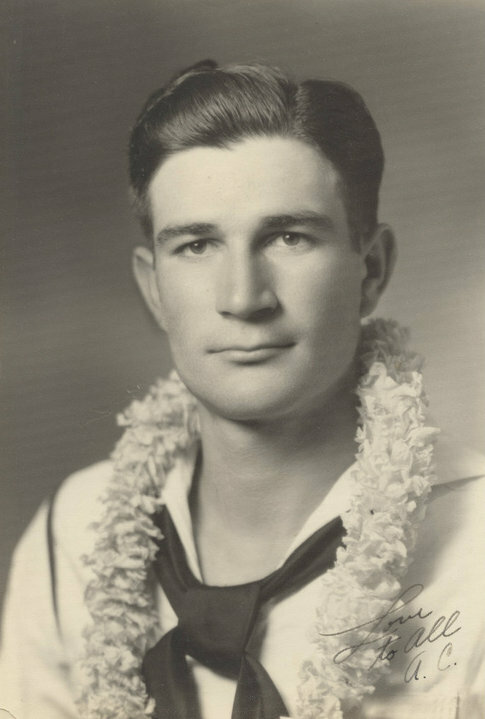 I am the daughter of a Pearl Harbor survivor. My father, Calvin C. Dawes, was a gunner’s mate on the USS Raleigh, a destroyer, when the attack commenced. I had not been born…yet that day impacted my life as no other. My dad was a month away from turning18 on that day. His mother had signed to allow him to join the Navy. He became a man the day the Japanese attacked. I wished I’d known the fun-loving boy, the adventurous youth he was before that day. I was never to know him in that way. Oh, his life went on after the war, he married mother, his high-school sweetheart. They had four children over the course of time, I was the second born. Yes, life went on. But not for dad. He recounted the moments that stole his youth, those moments seared in his brain forever. We heard the stories, lived through it with him. It was real to us, as if we had been there with him. O700 hours. A dull explosion hit the ship. All hands were called to general quarters and 5 minutes later the anti-aircraft guns on the Raleigh opened fire. The ocean water was boiling. Dad did his job as he was trained, with no time to think, no time to be afraid. Men hollered orders, ran back and forth with ammunition. Everyone did their job to perfection. The ship started to list toward port. An airplane torpedo struck #2 fireroom and flooded it. #1 & #3 were reported flooded, too. It looked as if the Raleigh would capsize. The noise was deafening, the smoke rising. Taste of burning oil was in the air. The gunfire was steady and accurate. Dad saw several Japanese planes fall out of the sky as a result of his mates and their training. A bomber flew over the stern of the Raleigh, burst into flames and crashed on the USS Curtis. Thank goodness for the training these men went through, that in the heat of battle, they could perform their duties without hesitation. Dad found out later that the Raleigh was responsible for the downing of five Japanese planes, all while listing severely. Proudly, he remembered everyone on board stayed at their posts and finished the job. The Raleigh survived the attack, no one on the ship was killed. A miracle, since the Utah and USS Raleigh were the first ships attacked. They were mistaken by the Japanese for the Lexington and the Enterprise. Even at his tender age, dad performed valiantly, as did all the men on the Raleigh, as stated in numerous reports. Dad would be in several other battles during the war, but none impacted him as much as that attack. He’d just begin telling the stories, over and over, as if they played like a movie in his mind. He was prone to fits of anger, weeping, emotional upheaval he tried to drown in drink. Back in that day no one heard of post-traumatic stress disorder, much less knew to treat it. Dad lived with it. A seventeen year old boy caught in one of the biggest naval battles in World War II history, forever to live with the extreme memories. I lost my dad about twenty years ago to a heart attack, but I always felt I’d lost him before I ever really knew him. The last two years of his life he would tell me he was sorry…sorry for the memories he forced on us. He seemed more at peace then. I held his hand and wept with him. Patty, thank you for sharing your father’s personal experiences with us. Both of our families owe our lives to the heroism on the Raliegh that day. I just mailed this blog post to my teenage sons. Thank you. Powerful experiences, powerful memories, and deeds that impacted the lives of many, and will continue to do so for a long time to come. Our world would not be as it is except for the actions of veterans like those that served on the Raleigh. We can show our gratitude best by remembering. Thank you T.James! You have summed up my feelings in a clear concise manner. I’m honored to be the son of a man taught principles he learned during his served and set that mirrored what he taught. I know that you honor your mother and commend you for that! I do, I was going to post about my father today, but did not finish the painting, so nice of you to honor you father and all of those heroes that did so much for us. It is fantastic that these personal memories are being documented so we and future generations will not forget. Hearing first-hand accounts serves to remind that war is not John Wayne theatrics (or a video game) and is something to avoid. Great job, and thanks to both of you for sharing! I consider it an honor to share this small token of appreciation and the opportunity to recount what little I know of the events. I hope you and other noticed the official Navy after action report link. That the crew of Raleigh kept her afloat is miraculous. Thank you both for sharing your family legacies on this tragic anniversary. It is through families like yours that our country is blessed with the freedoms it enjoys. It’s thanks to the bravery and courage of men like your fathers that we are able to celebrate that hard-won peace with this solemn day of remembrance. God bless you both and your families. Thank you, Charity. You’re comments are greatly appreciated. Thanks for these great memories, Rich Weatherly and Patty Wiseman. Will share with some family members. You are welcome. Thanks for joining me.